DA seizes a grandmother’s house when her grandson consummates a marijuana purchase by telephone from his bedroom. In New York City, the District Attorney applies a similar procedure but, instead of seizing the cash, the occupants walk home while their car hangs from a tow trucks hook as it is hauled off at the order of the police based on the DA’s reasoning. A couple sells their home to move to a larger home to raise their growing family. The buyer is cash poor, so they agree to finance part of the down payment by taking a second mortgage. The new owners open a brothel unknown to the former owners (who still own a second position in the property.) When the prostitution ring is busted, the house is seized, and the previous owners lose their property interest and their money. Cheung family, owners of a Michigan eatery, took $135,000 from their bank account because the deposits were in cash leading the IRS to suspect the Cheungs of criminal activity. The Asian Americans sued on their dime to have the money returned. Aside from attorney’s fees, they lost interest, a soiled reputation, and distress to their business. The IRS never apologized. In all of these cases, the taking was justified because the property, in effect, committed the crime, even if, as in the Volusia County case (or others), it was only virtual. That, at least, is the reasoning of legal authorities seeking any and all options available to obtain revenues without resorting to legislation, a very messy and uncontrollable process. CAF is used in many areas of government. Not just law enforcement. The IRS, ATF, FTC, EPA, SEC, etc. all find that CAF is a better way to raise funds than to hassle with legislation, particularly in a down congress, viz., legislators loath to author funds to regulators when the administration claims to veto new rules. For local policing agencies, CAF is the Key to The Kingdom. Now that half of the assets seized are shared with local authorities due to the passage of The Comprehensive Crime Control Act of 1984. (Wikipedia, 2015), police are free to arm themselves like the urban terrorists most Americans witnessing them at work see them as having become. This Comprehensive Crime Control Act was not the law establishing minimum sentencing guidelines. It did, however, establish the US Sentencing Commission which, in certain instances exceeded the penalties established by the Anti-Drug Abuse Act of 1986. So what happens to the seized assets? Here’s an example: A small-town Southern sheriff seized a Rolls-Royce from a drug dealer and used it as his car. Admittedly an extreme example, but without checks on the base nature of evil men, those given the reins of police power will invariably use it to enrich themselves or enhance their capacity to maintain control. The origins of CAF occur in 17th Century maritime law. The origins of civil forfeiture are often traced back to the British Navigation Acts, a series of maritime laws created in the mid-17th century. To distinguish between trading vessels, it mandated that all ships importing or exporting goods should bear the British flag; any ship that did not do so — regardless of whether or not it broke the law — could be immediately seized. … [A] vessel which commits the aggression is treated as the offender, as the guilty instrument or thing to which the forfeiture attaches, without any reference whatsoever to the character or conduct of the owner. [The seizure of the ship is justified by …] the necessity of the case, as the only adequate means of suppressing the offense or wrong, or insuring an indemnity to the injured party. The State has, since the Europeans set foot on the continent, attempted to abrogate rights of certain classes of citizens. Even more so the natural rights of non-citizens and aboriginals. Nevertheless, as to themselves, settlers saw such forfeiture laws as “unreasonable searches and seizures which deprived persons of life, liberty, or property, without due process.” Seizures were infrequently used to satisfy taxes, and so forth. Despite initial inklings from Donald Trump to the contrary, it is now apparent that Jeff Sessions is pushing all law enforcement agencies to abuse this cruel practice to its utmost. CAF in the middle of this decade was beginning to come under some control be state houses and governors, like John Kasich, who signed legislation limiting forfeitures only to property involved in crimes where convictions had been obtained. In 2010, 11,000 forfeitures were non-criminal out of 15,000 cases. In 1986, $93.7 million was taken, in 2008 the total was $1 billion, in 2010, $2.5 billion. Between 2001 and 2014, New York City gathered $27 million, Los Angeles, including LA County, raked in over $42 million. 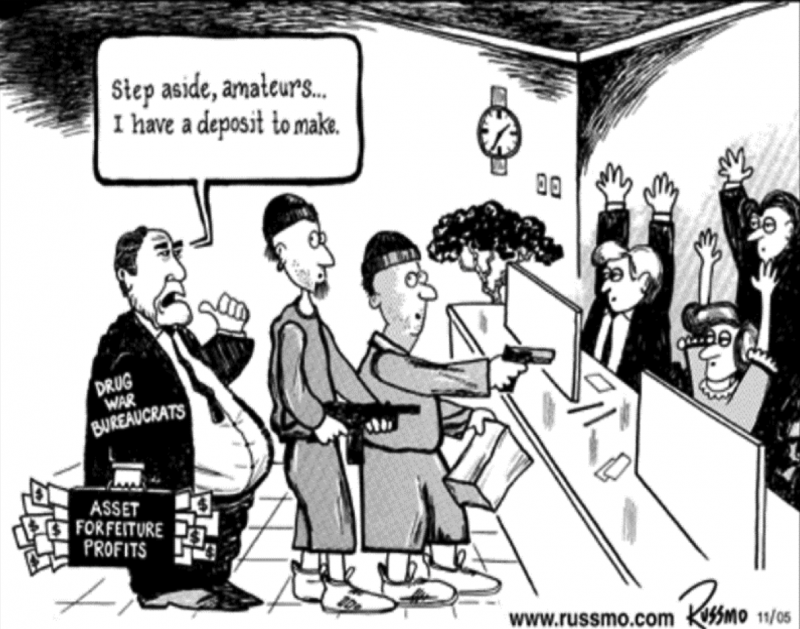 Deterrence: They claim that the threat of the loss of assets will dissuade criminals from risking criminal behavior. First, the payoff on the black market, a feature of all prohibitions, is more substantial (including the probable losses) than the risk of forfeiture. Also, deterrence, in general, has little effectiveness in preventing a crime that exists only as the result of a prohibition and, again due to the ban is so profitable. Enhance police cooperation: Effective training and hiring better personnel to effectuate interagency esprit de corps far better than, what amounts to bribing them with the prospect of ill-gotten gains. Revenue: This is the real reason, and they are cynically honest about it. The other two, as ridiculous as they are, pale in comparison. I already discussed this but to reiterate, when the City Council (for example) has a bunch of angry taxpayers yelling at them, instead of enacting new taxes, surcharges, or user fees it is easier to let the police steal for them. With men as wrong as Jeff Sessions (Mitchell, 2017), we need to educate our local audience as well as demonstrate our leadership. Our battleground is the statehouse and a plan to limit CAF abuse here similar to the Ohio plan of Kasich over the next year. Bernstein, D. E. (2011). Rehabilitating Lochner. Chicago, 60637: The University of Chicago Press. Epstein, R. A. (1985). Takings. Cambridge, Massachusetts: Harvard University Press. Locke, J. (1960). An Essay Concering the True Origin, Extent, and End of Civil Government (Vol. V). (P. Laslett, Ed.) New York: Cambridge University Press. Pilon, R., & Burrus, T. (Unknown). Chapter 5 – Civil Asset Forfeiture Reform. In R. Pilon, & T. Burrus, Ending Legalized Piracy (pp. 31-34). Washington, DC: CATO Institute. Siegan, B. H. (1976). Other People’s Property. Lexington, Massachusetts: University of San Diego. Siegan, B. H. (1980). Economic Liberties and The Constitution. Chicago, 60637: The University of Chicago Press.